Computing seems to be the hottest ticket in town. 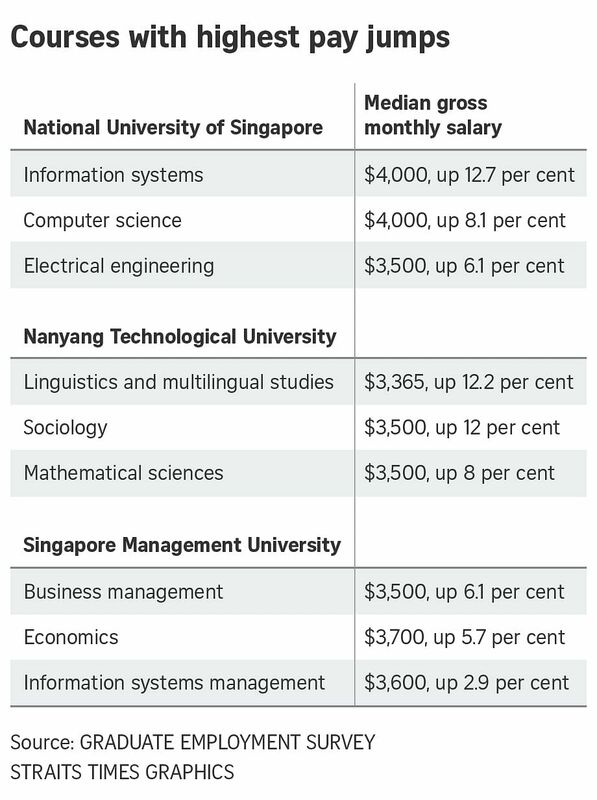 Graduates from the information systems course at the National University of Singapore (NUS) saw the highest jump in salaries, according to the latest graduate employment survey. They took home a median monthly salary of $4,000, a 12.7 per cent rise from 2015, when their seniors earned a $3,550 pay cheque in their first month. Graduates from NUS' computer science course also saw a pay rise, by 8.1 per cent - from $3,700 to $4,000. Linguistics and multilingual studies graduates from the Nanyang Technological University (NTU) enjoyed an increase of 12.2 per cent, from a monthly salary of $3,000 to $3,365. Third on the list were NTU's sociology graduates - their pay increased from $3,125 to $3,500, a 12 per cent jump. The figures reflect the current job market, said Mr Adrian Tan, co-founder of Career Hero, a resume optimisation platform. "Big companies are trying to break into the tech industry, while there has also been an increase in the number of tech start-ups. They have led to higher demand for computing graduates and software developers," he said. He added: "Moreover, local universities are not producing computing graduates fast enough, but companies here cannot engage that many foreign employees because of hiring limits." Besides computing, engineering graduates were also highly sought after, with NUS' electrical engineering graduates experiencing a pay jump from $3,300 to $3,500 - a 6.1 per cent rise. "This could be due to the importance of hardware designing in the tech industry, which is not only about software," said Mr Tan. Mr David Leong, managing director of PeopleWorldwide Consulting, a human capital provider and management company, said that as engineers are taught to approach problems systematically in their training, their skill sets will be in demand. Those with degrees in law and medicine remained the most well paid across the universities. Graduates with a degree in medicine from NUS were the highest paid, drawing $5,000, followed by $4,900 for NUS law graduates and $4,850 for Singapore Management University law graduates.